Below is a published reflection of 2014 Australia Day, which some time later became a published opinion piece in Online Opinion. The article contains never before published material of dramatic events during John Howard's 2001 Operation Relex, when boats with passengers seeking asylum were first pushed and towed back to Indonesia. On the Friday afternoon before Australia Day I watered my garden wearing my sandals, quenching the long rows of Grevilleas in my backyard. I had planted them three years ago to establish a hedge replacing the broken fence surrounding my property. When I felt the sharp sting of a bite inside my sandals, I took care to immediately shake out my footwear, but did not spot the creature that had snapped at my right foot. I forgot about the incident until late that night, when it started to itch quite uncomfortably, and by the time I woke up to a hot and sunny Saturday morning, my foot was swollen and painful, and two enormous blisters featured on top of what was now a throbbing red centre of unease for the rest of the day. I spent most of the day reading with my leg elevated to minimise the trauma to my foot, but during the quiet evening I became too eager to explore the cause of my discomfort and hobbled across the road to enter the hospital grounds in my country town, taking the shortcut through the covered 'staff-only' walkway to the near-deserted emergency clinic. I took the first person to inspect my foot to be a hospital orderly because he was a large, slightly overweight and burly bloke dressed in green hospital overalls, but he startled me when answering a question from one of the nurses about some hormone-related medication. Within 60 seconds he had cited two peer-reviewed studies into the treatment's effectiveness, listed some minor side-effects and concluded that he would be comfortable to have the medication in his own family's medical supply cabinet. This was not just a burly Aussie bloke, but he was the locum hospital doctor, on duty during the Australia Day weekend with three staff - and he was pretty good. I'm not sure what sparked our conversation and why it so suddenly had taken the direction it took. Of course things were relaxed - even festively quiet this Australia Day weekend. Perhaps the ice really broke when I broke the news to the doc and the nurses that it was Adam Goodes who had moved past the nominations as the 2014 Australian of the Year. With a wry smile on my face I had called Goodes' appointment as the only decent achievement thus far by an otherwise extremely brazen, politically fanatic and rather incompetent Tony Abbott administration. Suddenly this burly bloke I had initially so dreadfully mistaken for a hospital orderly was someone who had full knowledge of the shadowy operations aboard HMAS Adelaide, Tobruk, Arunta, Manoora and Warramunga during the last five months of 2001 and the beginning of 2002 - all of them involved in intercepting and towing back boatloads of asylum seekers on rickety wooden vessels - towing them back to Indonesia. Our town's locum doctor had been a Navy doc on John Howard's High Seas and High Drama in the period of a dozen or so 'Suspected Illegal Entry Vessels' - Howard's clever new badge of the refugee boats, so useful for electoral purposes. My locum had been amongst the SIEV 1 to SIEV 12 in Australia's northern waters during the heady period around the 2001 election. (If you haven't informed yourself about these events, read David Marr and Marion Wilkinson's Dark Victory, a book still widely regarded as the most authoritative account of Australia's 'Tampa election' of 2001). As he mentions the 'children overboard' saga of SIEV 4, The Olong, the doc's disdain for Howard's Defence Minister Peter Reith is palpable, and there is nothing casual about the memories he recalls, stirred as they undoubtedly are by this year's repeat of history under Tony Abbott and Scott Morrison, who are currently busy - in secret, but unenviably more brazen than under Howard - pushing and towing boats back to Indonesia. I tell him how I suspected it was someone in the Navy who leaked dozens of photographs of the SIEV 4 rescue to me when I received an anonymous email from someone in 2002. The photos are now displayed on the website of the refugee action and advocacy group I coordinate. His last story comes within just a few sentences. There's no hyperbole, rhetorical flourish or practised story-telling in his sober account. Rather, his raw emotions and searing pain is just under the surface as he talks. He tells me how one of the men on the last SIEV had his ankle wrapped around the towing rope as they started the tow-back, resulting in a serious injury - a broken leg. As the doc, he prepared him for hospitalisation. Meanwhile, a pregnant mother pleaded with him and other Navy personnel with all persuasion she could muster, wanting to remain with the man, who was her husband. 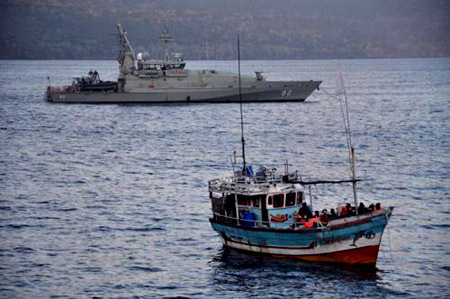 The Navy could not relent, and she remained on the vessel that was towed back to Indonesia. A few days later the woman was dead, drowning before she could reach land in Indonesia. The doc concludes with a "That was it. That's when I quit the Navy". Throughout our conversation, he had not disclosed any names of Navy personnel or names of Navy vessels, refugee boats or any SIEV denominations. Even now, 12 years after he quit his job, he honours the well-practiced confidentiality restrictions, and he's not about to break out into slander of our national maritime forces. But it's clear from his story that when he quit, he resigned not just because he'd had enough, he couldn't take it anymore, but also because he refused to be linked any further with operations that compromised him as a human being and a man with a heart and with decency. Many Australians are keen to make New Year's resolutions, no matter how often these promises are kept or broken. It doesn't matter, really: the start of a new year is always an opportunity to make a new beginning. Perhaps we need to equally cultivate an annual round of Australia Day resolutions for each anniversary of the birth of our modern Australia. In that context I wish you all an Australia Day resolution that stops you "swallowing all the manipulative rhetoric, spin, fibs and lies about asylum seekers and refugees dished up by Australian politicians", because I suspect that - for whatever reason - too many Australians, rather than informing themselves, are quite happy to swallow political spin and fibs from their politicians. So, if you're in the camp of the Australian masses who believe that asylum seekers coming by boat are queue jumpers, or economic migrants or Muslim invaders wanting to overturn our western world order, then I suspect you to be a "spin swallower". If you think that a rich refugee cannot be a refugee, or that the UN Convention does not apply to asylum seekers on boats, or that it's outdated, you're also a likely "swallower", and if you're under the illusion that a common law or a legal tenet exists in Australia that justifies calling asylum seekers "illegals" or that they're committing a crime by arriving here without prior arrangements, then you're a swallower too. I suggest you start informing yourself from the best international and national, highly credited and widely available sources. David Marr's book above seems like a good start. From this Australia Day onwards, you might like to join those who row against the stream of the majority of swallowers. Several decades ago, some Australians, together with Australian Aboriginal people, started doing that too around the rights for the First Australians - and look how far we've come by being able to get Adam Goodes as the Australian of the Year. Wanna know what it feels like to row against the stream of indecency for just things? Ask Adam. Foot-note: Finally, my medical circumstances deserve a 'footnote'. I was most probably bitten by a Jumping Jack Ant, a species that delivers a copious amount of venom. Anyway, the swelling has receded, the doc put me on antibiotics and I think my foot will survive. Jack Smit is a refugee activist and advocate who co-ordinates Project SafeCom. In 2011 he completed a Masters Research thesis on the politics of Australia's people smuggling legislation at Edith Cowan University in Perth.